As house builders reflect on highly positive results for 2015, with completions and revenue up against 2014 figures, many believe that the scene is set for a more positive outlook this year thanks, in part, to improved consumer confidence and the array of government initiatives that support home ownership. “While average new build prices rose by nearly 6% in the year to the end of January 2016, this is slightly less than the 7%+ reported at the end of January 2015. The North East, in particular, has contributed to this slight decline with prices of new build flats now 8.3% less than they were a year ago. 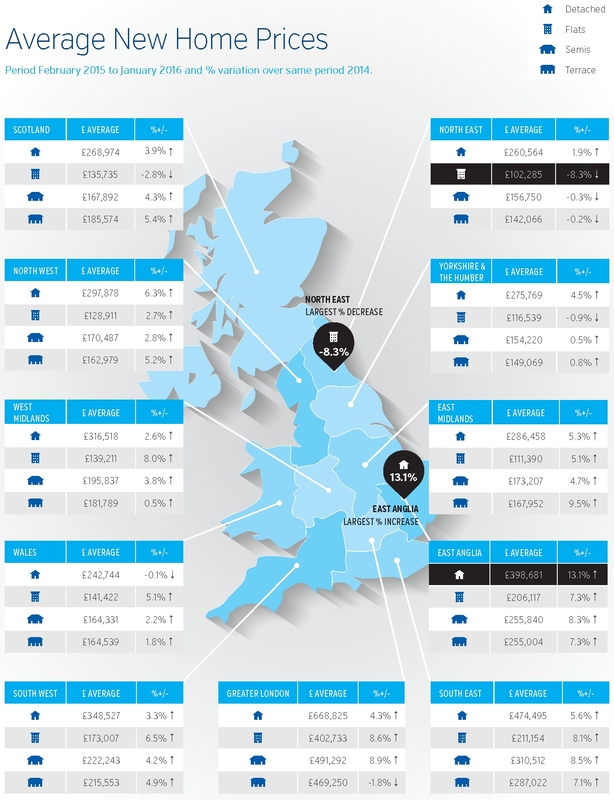 In addition areas within Scotland, Wales and Yorkshire and the Humber have also seen some reduction in prices.